Connecting I-94 and WIS 59 via a new bypass expanding the former footprint along Meadowbrook Road/Merrill Hills Road. View project overview information here. In 2019, crews will be working on Phase 2 of the West Waukesha Bypass by focusing on improvements from WIS 59 to US 18. The realignment of Merrill Hills Road is currently underway. In April 2009, a Memorandum of Understanding was signed by Waukesha County, the City of Waukesha, the Town of Waukesha, and WisDOT, identifying the local, county, and state responsibilities for building the West Waukesha Bypass. 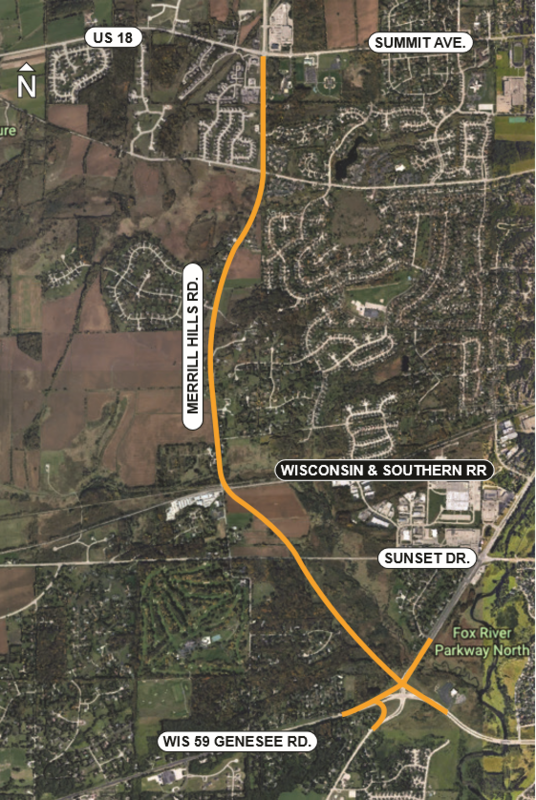 The intent of the project is to provide a roadway facility on the west side of the City of Waukesha to safely and efficiently accommodate existing and future traffic volumes. To better accommodate the flow of traffic, segments of the existing roadway will be expanded from two lanes to four. This project will provide a link around the city by connecting I-94 and WIS 59.